This elegant, yet modest flowy maxi skirt will definitely impress. Wear it to the formal occasion, haute date night or dress it down for Sunday brunch. Fold over design allows your dress to perfectly match the length of your legs every time. A wardrobe necessity. 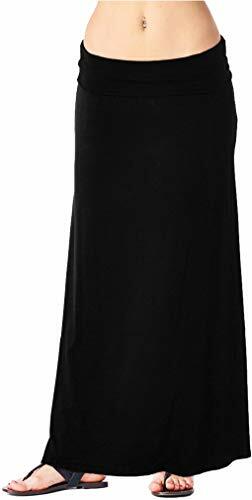 Maxi skirts are a wardrobe staple for most of us during the spring and summer, but they can also be worn during the fall and winter as well. That's what's so great about them - they're versatile, easy to style with anything, and incredibly comfy. If you didn't buy one yet, you need to for spring, because there are so many outfits you can create with one. Wear your maxi skirt with a crop top. Wear it higher on your waist so you show very little skin, or wear it lower to bare your stomach. Whatever you're comfortable with. Layer a blazer over a tee and maxi skirt for an easy fall or winter look or Kick your outfit up a notch by layering with a jean jacket. This is great for fall or spring. If you have any questions about this product by Popana, contact us by completing and submitting the form below. If you are looking for a specif part number, please include it with your message.